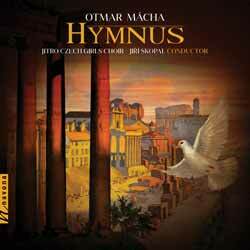 On Hymnus, for the most part, the choir performs without any instrumental accompaniment, save for several Moravian folk songs, on which a solo piano provides an additional layer of intricacy, and for the album’s closing track, 'Hymnus'. Combining the stirring instrumentation of kettledrum and organ with the Choir’s uplifting vocals, 'Hymnus' translates the positive, humanistic vision of John Amos Comenius, the 17th century educator, philosopher and theologian, into what serves as a superb melodious conclusion of this impressive recording. It's an interesting mix of styles and genres that is delivered here. And while the serious collector will enjoy the deep and stirring pieces on offer, I couldn't help but chuckle (like an immature school boy) when listening to 'Proverbia - Vivite'. It could be because my girlfriend has recently taken to forcing me to visit the new IKEA store in Devon quite a bit... but I'm sure this is a song about IKEA. I'm sure I didn't mishear the lyrics, as it opens with: "Meet me there" repeated several times, followed by "Meatballs!" sung a number of times. However, enough of my nonsense. For those interested in traditional Czech culture, or choral works in general, there's a lot to discover here.